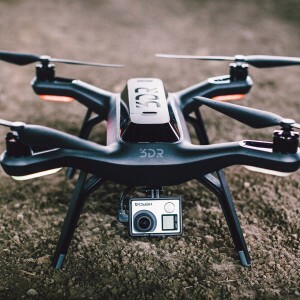 Today 3D Robotics released the Solo, which when the GoPro is factored in, works out more expensive than a Phantom 3 but we would argue offers more functionality and future proofing with altogether better customer service. The Solo has a base price of $999 with the 3 axis gimbal costing $399, on to which you’d add your GoPro, albeit many drone owners already have a GoPro. One cost the design avoids is the need for retracts or a 360 degree gimbal, the gimbal and flight controller run via a shared algorithm, the gimbal runs in master mode which means, when you yaw, you yaw the gimbal and the copter follows. For videophotographers there’s more good news, the Solo can control the shutter (i.e. start/stop video) and also the framerate of the GoPro. Whilst 3DR didn’t have a live release unlike DJI, 3DR did have two very professional videos, one a slightly over the top cinematic promo and one a more informative video focussing on the video simplicity of the Solo application. We’re glad 3DR has made a point of pushing its customer service offering in its press releases today as drones are still a relatively expensive purchase and should a software bug or a hardware failure cause a crash, it’s not always fair to expect the consumer to pick up the bill. 3DR is offering 30 days cash back to customers who are not happy alongside its commitment to make right crashes that are its fault. 3DR whilst never having made a sales point of it, have always tried to be pragmatic with crashes of their drones, willing to examine the logs explain why a crash has occurred and when the root cause has been their fault, they have been seen to step-up and put things right at their own expense, so this isn’t new for the Solo, but now 3DR are making a point to let potential customers know. Going off on a tangent for a moment we were glad to see in the preview of the Solo in The Verge, our endearing name for Colin Guinn “the Guinnmeister” was used, we hope we’ve set a trend. The article is a good read, our only concern was some jello on this footage, albeit we couldn’t see any on the video released by 3DR themselves. The Solo features the Pixhawk 2 which hasn’t been seen before today, in fact generally it wasn’t known to even exist. It’s essentially a Pixhawk with more sensors, it has 3 x 3 axis accelerometers, 3 x 3 axis gyros, 3 x 3 axis magnetometers, 2 x barometers, with in built vibration isolation. The physical size of the Pixhawk 2 is around 50% smaller. In addition the Solo has the SoloLink which is a companion Linux computer that talks to the Pixhawk via high speed serial using Mavlink. DroneKit is at the heart of SoloLink and allows the higher level control to do Smart Shots. The HD video link is new for 3DR and provides 720p up to half a mile, given the antenna can be changed it’s possible this can be extended. The application software looks simple and has taken away the complexity seen in typical Arducopter applications which should make the Solo very accessible for new users. A gimmick that we all pretend we don’t think is cool, but is really, is the fact the LED colours can be changed to suit your personal preference.